One of the new features introduced in PeakTrace 6.10 was the use edited basecalls setting. This option allows the retention of manual basecalling changes to the sequence when the fuse trace or fuse basecalls settings are used. This setting can be useful if you wish to correct KB Basecalling errors before PeakTrace Basecalling and the result is best illustrated by example. Figure 1 shows a KB basecalled trace file. Note the basecalling error made by KB at base 6 where an obvious G peak was called as a low quality T.
Figure 1. KB basecalled trace before manual editing. Figure 2 shows the same trace after manual editing using Chromas. Note the T at base 6 has been manually changed to a g.
Figure 2. KB basecalled trace after manual editing to correct basecalling errors. Figure 3 shows the manually edited trace after PeakTrace Basecalling using the default fuse trace setting of 1, but without the use edited basecalls setting. Note the edited G base at base 6 has reverted to the original KB basecalled T.
Figure 3. PeakTrace basecalled trace using fuse trace without use edited basecalls. Figure 4 shows the manually edited trace after PeakTrace Basecalling using the default fuse trace setting of 1, but with the use edited basecalls setting. Note the edited G base at base 6 has been retained in the final call. Figure 4. PeakTrace basecalled trace using fuse trace and use edited basecalls. It is important to understand that the use edited basecalls only applies to the KB basecalled sequence retained by the fuse trace or fuse basecall options. Any manually edited basecalls that are subsequently replaced with PeakTrace basecalls are not kept. Of course any PeakTrace basecalled trace can be manually edited after basecalling just like KB. If you wish to retain more of the manually edited basecalls then you can use a larger value for the fuse trace or fuse basecall setting (e.g. use 300 instead of 1). We have updated Auto PeakTrace RP to version 6.43. Most of the changes for this release are in the backend server so everyone using PeakTrace RP will get the improvements automatically, but there is a local client fix for a warning bug when auto start is used. One of the new features introduced in PeakTrace 6.40 was Set ABI Limits. This option changes the PeakTrace trimming functions from hard trims (i.e. actual removal of the low quality regions) to the same soft (virtual) trimming that is performed by the KB Basecaller’s Post-Processor module. 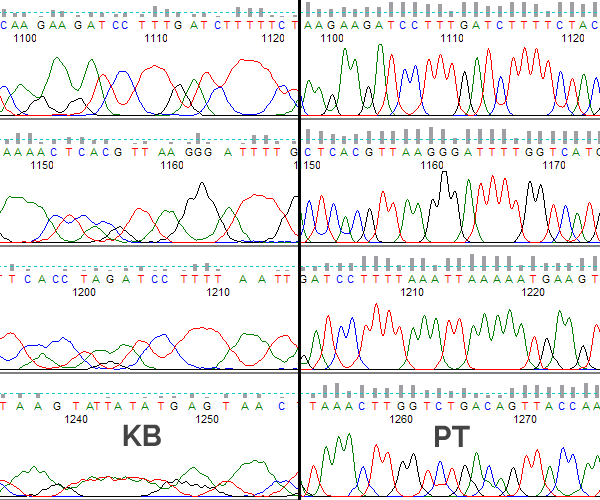 If trace trimming is selected within Sequencing Analysis, then KB will remove the low quality regions from the trace by setting the ABI Limits values in the trace file to indicate the high quality region. When the trace or basecall is viewed in Sequencing Analysis or Sequence Scanner, the trimmed basecalls are still present, but the peaks and bases are now grey (Figure 1). Figure 1. Example trace viewed in Sequence Scanner with the ABI limits range set. The ABI limits region starts at base 15. PeakTrace is now also able to set the ABI Limits values by using the Advanced Option Set ABI Limits with trace trimming. Instead of the hard removal of the low quality regions, these regions are “greyed out” when viewed in Sequence Scanner or Sequencing Analysis – just like KB (Figures 2 & 3). Figure 2. PeakTrace basecalled trace using Set ABI Limits and Q Average Trim of 12 & 20. The last low quality region has been greyed out. Figure 3. PeakTrace basecall using Set ABI Limits and Q Average Trim of 12 & 20. The last low quality bases are shown in grey and the high quality regions in blue. One of the limitations with using Set ABI Limits is that none of the non-ABI trace viewers are able to use the ABI limits region. For example, Figure 4 shows the same trace as shown in Figure 2, but in FinchTV. The low quality region after base 1390 is not shown greyed out or trimmed by FinchTV. Set ABI Limits is a very useful addition for those users of PeakTrace who wish to replicate the results provided by the KB Basecaller as close as possible. 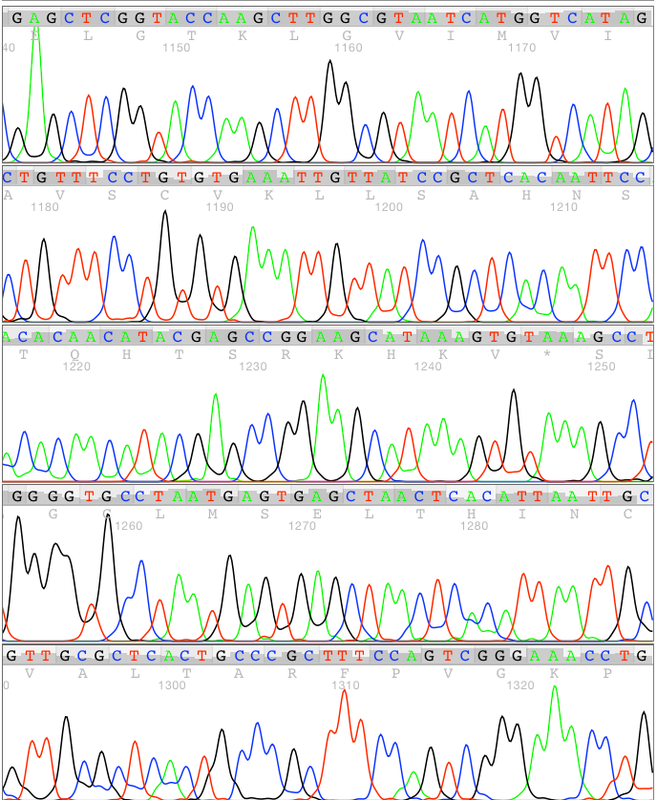 It provides the same “greyed out” trimming of the low quality regions that Sequencing Analysis Post-Processing provides. Users of this setting are encouraged to upgrade to PeakTrace 6.42 or greater as this release has introduced a workaround for a bug in Sequencing Analysis that stops the display of the 3’ trimmed region when the 5’ end is untrimmed. Improved processing of traces with large peaks. Change to the abi limits module to make the minimum start base 1 rather than 0. This fixes a display bug for traces within ABI’s Sequence Analysis™ software. If you are not a current user of Auto PeakTrace RP 6 then please visit the Auto PeakTrace 6 RP registration page to create a PeakTrace account. We have released Auto PeakTrace RP 6.41. This is a minor update, but with a number of important changes to the internal modules that improve the performance and basecalling quality. The full list of changes include. Improvements to the basecalling of traces containing mixed bases. Improvements to clean baseline and extra baseline processing of traces. Improved handling of traces that are basecalled with kb or peaktrace/kb options. Improvements to mixed basecalling module. Reduced memory requirements and increased processing speed. If you are not a current user of Auto PeakTrace RP 6 then please visit the Auto PeakTrace 6 RP registration page. 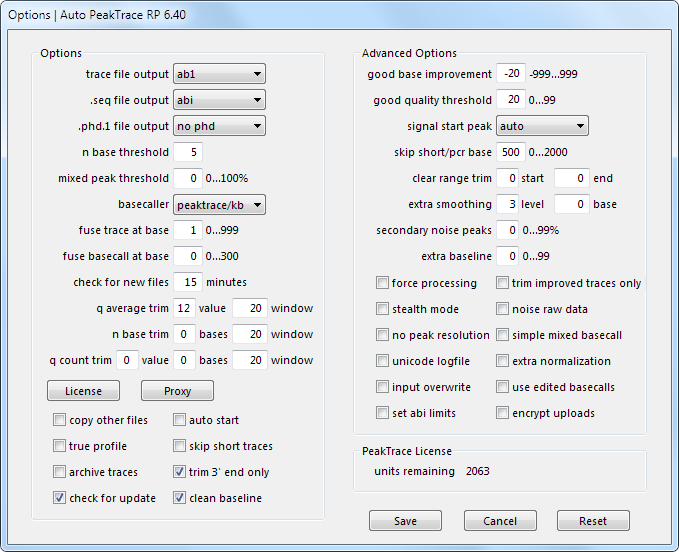 We have released Auto PeakTrace RP 6.40. The is a major update that significant improves trace quality output and appearance. We have changed the Options menu to make Auto PeakTrace RP easier to use and updated the default settings to make best use of the new settings. In addition, we have improved the help manual and added a new feature which allows the ABI Limits values to be set by PeakTrace instead of hard trimming. The full list of changes include. New Feature. Set ABI Limits. New Feature. Improved Options layout and default settings. Improvements to the extra baseline setting to allow user control of the threshold for secondary peak removal. Improvements to the clean baseline setting. Improved processing of traces generated using BigDye 1.1 chemistry. Initial support of the NimaGen BrilliantDye™ Terminator chemistry. Bug fix for the abi+kb output option. This update is highly recommend for all user of Auto PeakTrace RP 6.30 or earlier. If you had been using the extra baseline setting with Auto PeakTrace 6.30 then you must upgrade to this version as the 6.30 version of extra baseline will no longer work. We have released Auto PeakTrace RP 6.30. This is a major update with two new features – extra baseline and secondary noise peaks. These two setting can improve the appearance of the traces and help to better match the appearance of PeakTrace basecalled traces to that obtained from the KB Basecaller. These new features are explained in the user help manual, but we will also be writing in depth articles on each of these new features. The full list of changes include. New Feature. Extra baseline option for improved appearance of trace files. New Feature. Secondary noise peak option to add peak noise to the traces. Unsupported run types now output .seq and .phd.1 files based on the KB sequence if these file types are requested. The logfile now records the local time rather than the server time of processing. Further improvements to increase the robustness of the software on very fast networks. Additional check that the archive folder can be created when using the archive traces option. Improved handling of traces processing when manually starting and stopping processing. If the n base threshold is set to 1 or 0 and the fuse basecall value is greater than 0, then any N bases from the original KB sequence will be basecalled. Upgrade of 7za to 15.14. If you are not a user of Auto PeakTrace RP 6 then please visit the Auto PeakTrace 6 RP registration page. Improvements to increase the robustness of the software on very fast networks. Improved cleaning of temporary files from the Application Data folder. Upgrade of cURL to 7.48.0. If you are not a current user of Auto PeakTrace RP 6 then please register on the Auto PeakTrace 6 RP registration page. We have released Auto PeakTrace RP 6.23. This is a minor update that helps the software overcome network issues. We have found that some of our users have poorly configured networks that prevent the Auto PeakTrace RP software from being able to upload trace files to the remote RP server. This update improves the robustness of the software to such networks.